28 mm polished finished steel case, yellow gold screw-down crown with the tudor logo, yellow gold bezel set with 52 diamonds, sapphire crystal, white dial with date at 3 o’clock, Calibre 2671 self-winding movement, approximately 38 hours of power reserve, steel and yellow gold bracelet, folding buckle. Water resistant to 100 m (330 ft). 28 mm polished finished steel case, yellow gold screw-down crown with the tudor logo, yellow gold bezel set with 52 diamonds, sapphire crystal, white dial with 10 diamonds and date at 3 o’clock, Calibre 2671 self-winding movement, approximately 38 hours of power reserve, steel and yellow gold bracelet, folding buckle. Water resistant to 100 m (330 ft). 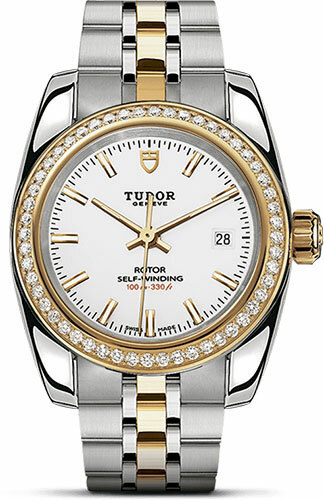 28 mm polished finished steel case, yellow gold screw-down crown with the tudor logo, yellow gold bezel set with 52 diamonds, sapphire crystal, silver mosaic dial with date at 3 o’clock, Calibre 2671 self-winding movement, approximately 38 hours of power reserve, steel and yellow gold bracelet, folding buckle. Water resistant to 100 m (330 ft). 28 mm polished finished steel case, yellow gold screw-down crown with the tudor logo, yellow gold bezel set with 52 diamonds, sapphire crystal, steel dial with date at 3 o’clock, Calibre 2671 self-winding movement, approximately 38 hours of power reserve, steel and yellow gold bracelet, folding buckle. Water resistant to 100 m (330 ft). 28 mm polished finished steel case, yellow gold screw-down crown with the tudor logo, yellow gold bezel set with 52 diamonds, sapphire crystal, steel dial with 10 diamonds and date at 3 o’clock, Calibre 2671 self-winding movement, approximately 38 hours of power reserve, steel and yellow gold bracelet, folding buckle. Water resistant to 100 m (330 ft). 28 mm polished finished steel case, yellow gold screw-down crown with the tudor logo, yellow gold bezel set with 52 diamonds, sapphire crystal, black-lacquered dial with date at 3 o’clock, Calibre 2671 self-winding movement, approximately 38 hours of power reserve, steel and yellow gold bracelet, folding buckle. Water resistant to 100 m (330 ft). 28 mm polished finished steel case, yellow gold screw-down crown with the tudor logo, yellow gold bezel set with 52 diamonds, sapphire crystal, black dial with 10 diamonds and date at 3 o’clock, Calibre 2671 self-winding movement, approximately 38 hours of power reserve, steel and yellow gold bracelet, folding buckle. Water resistant to 100 m (330 ft). 28 mm polished finished steel case, yellow gold screw-down crown with the tudor logo, yellow gold bezel set with 52 diamonds, sapphire crystal, champagne-colour mosaic dial with date at 3 o’clock, Calibre 2671 self-winding movement, approximately 38 hours of power reserve, steel and yellow gold bracelet, folding buckle. Water resistant to 100 m (330 ft). 28 mm polished finished steel case, yellow gold screw-down crown with the tudor logo, yellow gold bezel set with 52 diamonds, sapphire crystal, champagne-colour dial with 10 diamonds and date at 3 o’clock, Calibre 2671 self-winding movement, approximately 38 hours of power reserve, steel and yellow gold bracelet, folding buckle. Water resistant to 100 m (330 ft). 28 mm polished finished steel case, yellow gold screw-down crown with the tudor logo, yellow gold bezel set with 52 diamonds, sapphire crystal, champagne-colour dial with date at 3 o’clock, Calibre 2671 self-winding movement, approximately 38 hours of power reserve, steel and yellow gold bracelet, folding buckle. Water resistant to 100 m (330 ft). 28 mm polished finished steel case, yellow gold screw-down crown with the tudor logo, yellow gold bezel set with 52 diamonds, sapphire crystal, champagne-colour mosaic dial with 10 diamonds and date at 3 o’clock, Calibre 2671 self-winding movement, approximately 38 hours of power reserve, steel and yellow gold bracelet, folding buckle. Water resistant to 100 m (330 ft).